As with last year's Teifi Tour we headed over in the daytime on Friday... but with the added faff of driving all over the place looking at low/empty rivers on the way. Could have had a few runs of the Llandysul slalom course, but had slightly lost the will to live by that point, as well as being in need of food and drink! We stayed in the same cottage as last year, but this time with added fancy dress. Alchohol was consumed, the cakepops were eaten, and fun was had by all. On Sunday I was not entirely in a state to do anything involving other people (bah), so went for a short walk along the Tywi whilst the rest of the group paddled it. Once they were done with that, a crack team of 'advanced paddlers' went for a run of the upper section, just below Llyn Brianne. 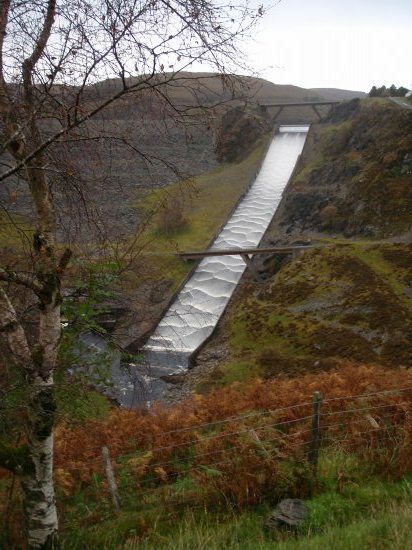 Obviously no-one went near the spillway itself, as that would be naughty and silly. (and I actually do mean that). It was getting dark by the time they eventually arrived at the get out - no-one was expecting us to have put a pumpkin on the bridge too greet them though!